:: What is a Cataract? 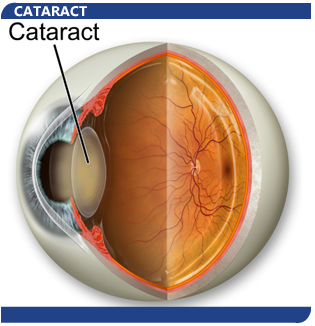 Rather, a cataract is a clouding of the normally clear lens of the eye. The lens is the primary focusing mechanism of the eye. As we age, this crystal clear lens becomes cloudy and yellow and loses its elasticity, or ability to change focus. When this occurs, it is called a cataract. A nuclear cataract is one in which the opacity is in the central nucleus of the eye. Cortical cataracts begin at the outer rim of the lens and gradually work toward the central core of the lens. This type of cataract resembles spokes of a wheel that extend from the outside of the lens to the center. Subcapsular cataracts affect the back of the lens, causing glare and blurriness. Of all cataract types, subcapsular cataracts progress the most rapidly. This type of cataract is usually seen in patients who use steroids, or who suffer from diabetes or extreme nearsightedness. The most common type of cataract is related to aging of the eye. Other causes may include family history, medical problems (such as diabetes), injury to the eye, medications (such as steroids), long term un-protected exposure to sunlight, and previous eye surgery. The symptoms of a cataract include blurry vision, glare or light sensitivity, double vision, frequent eyeglass prescription change, needing brighter light to read, poor night vision, and fading of colors. How quickly the cataract develops varies among individuals, and may vary even between the two eyes. Most cataracts associated with aging progress gradually over a period of years. Other cataracts, especially in younger people and people with diabetes, may progress rapidly over a few months. Overall, it is not possible to predict exactly how fast a cataract will develop for any given person. It is not true that cataracts need to be "ripe" before they can be removed. A cataract should be removed when it begins to affect your lifestyle. Can you perform daily tasks without difficulty? Do glare and blurry vision interfere with your driving? Or have you given up your favorite hobby? Cataract surgery can be performed when your visual needs require it. Cataract eye surgery involves the removal of the natural, clouded lens of the eye and its subsequent replacement with a clear, artificial lens. The cataract surgery procedure is usually performed under local anesthesia on an outpatient basis. The entire cataract surgery usually takes less than an hour. There are several variations in both the removal and the replacement portions of the surgery. The technique used depends on the patient's needs and the physician's diagnosis, as well as the type of cataract involved.